Is the GTX 480 the fastest and best graphics card ever built? The Nvidia GeForce GTX 480 is indeed the fastest single GPU graphics card in the world. The air of relief is palpable as the great and the good of Nvidia gather beside this latest graphical opus in its downtown Paris office. The relief is not just our ours at having finally gotten hold of a working sample of the GeForce GTX 480, but representing the culmination of a lot of hard work, a lot of missed launch slots and a lot of rumour-mongering in the world's tech press. It's one hell of a relief for everyone at Nvidia associated with the GeForce brand. The opening slide of the inevitable PowerPoint-a-thon is simply one word standing clear on a black background: finally. So yes, finally it is here. 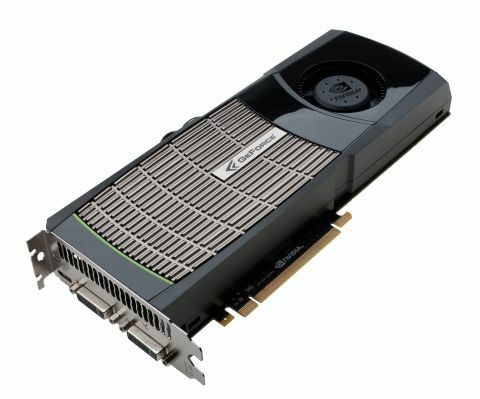 The GF100 GPU - known as Fermi - exists outside of the rumour mill and has its first derivative card; the GTX 480. There will be others along very soon, most noticeably the cheaper GTX 470, but this graphical behemoth represents the top-end of Nvidia's Fermi launch. Originally pencilled in for a pre-Christmas debut, the DX11 riposte to AMD's HD 5xxx series of graphics cards has seen innumerable delays, sparking fears that something had gone badly wrong with Nvidia's brand new silicon. We had expected the fastest derivative of the new Fermi architecture to be around the £600 mark - putting it in direct competition with AMD's fastest graphic card, the ATI Radeon HD 5970. But with a recommended launch price of just over £400, it's immediately obvious where this card sits without even having to look at the benchmarks. It sits slap-bang in between the two top AMD cards - the Radeon HD 5870, still topping £300, and the HD 5970, knocking on the door of £600. Having a completely redesigned architecture and a half-year delay, there's no way Nvidia could afford to under-cut the competition with this part. So we'd already expected the performance to completely reflect the pricing.